Shadegan County can be found at GEOnet Names Server, at this link, by opening the Advanced Search box, entering "9206391" in the "Unique Feature Id" form, and clicking on "Search Database". 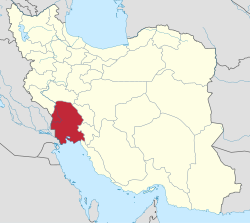 Shadegan County (Persian: شهرستان شادگان‎) is a county in Khuzestan Province in Iran. The capital of the county is Shadegan. At the 2006 census, the county's population was 138,226, in 23,813 families. 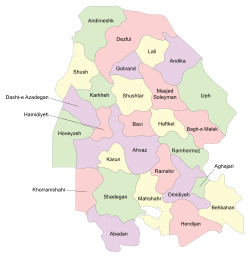 The county has two districts: the Central District and Khanafereh District. The county has three cities: Shadegan, Darkhoveyn & Khanafereh. This Shadegan County location article is a stub. You can help Wikipedia by expanding it.